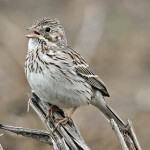 Song, heard only on breeding grounds, is series of rapid warbles and twitterings. Description: White tail marked by blackish inverted T-shape. Bill is stout and thick at base. Breeding adult male has black crown; black whisker stripe on whitish face; black bib; black bill; and gray sides. 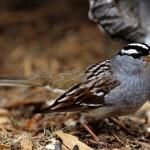 Buffy upperparts are streaked with brown; gray nape and rump; white belly; and bright chestnut wing patch. 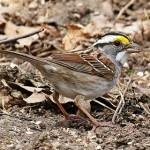 Breeding adult female is brown overall with streaking on crown; may or may not have black on breast; shows less chestnut on wing. Winter male lacks black crown and whisker stripe; bill is pinkish with dark tip; diffuse black bib; and conspicuous gray rump. Winter female is paler overall. 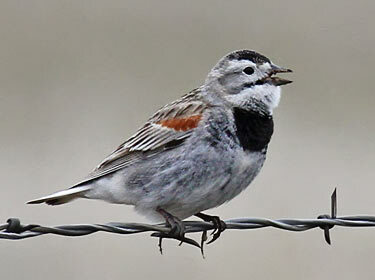 Habitat: Migrants found in short-grass prairies, pastures, and plowed fields. Nesting occurs in short and mixed-grass prairies, stubble fields, and newly sprouted grain fields. Where in Nebraska: Common to uncommon spring and fall migrant and winter visitor in western Nebraska, becoming rarer eastwardly. Common to uncommon summer resident in the Panhandle. Status: Population has declined with destruction of prairie habitat. Field Notes: Often found in winter amid large flocks of Horned Larks. Fun Facts: McCown’s Longspur males display for females with aerial displays, where he flies upwards and sings while floating down, only to repeat the process.